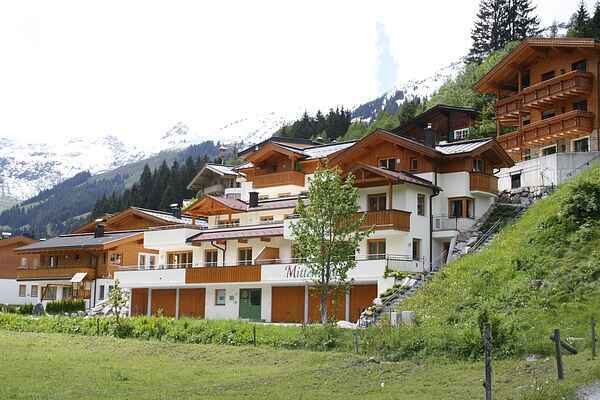 This modernly and very luxuriously decorated holiday complex is located right next to the centre of the famous Hinterglemm, at the sunny side of the Glemmtal. Your spacious holiday home, which is located on the first floor of this complex, consists of a cosy living room with a big open-plan kitchen and direct access to the large terrace. In addition, you'll have 2 spacious bedrooms and bathrooms. Everything is airy and luxurious, making you feel right at home. Due to its location on a slope you have a breathtaking view. There is a parking space for your car. The 1st floor is also accessible to wheelchair users via a platform lift. In short: a definite recommendation. Just 300 meters from the house in the winter , there is a beginners slope with a lift and a free ski bus to the vast and renowned ski resort Saalbach-Hinterglemm. You can choose from cross-country skiing, hiking, sledding or a lovely carriage ride, all located in the immediate vicinity. If you come in the summer, the Glemm Valley offers plenty of hiking and mountain biking opportunities and many organised activities. A visit to Zell am See, Kaprun or Salzburg is also worthwhile.